Challenged with a massive fundraising goal to build a prominent outdoor memorial, the Civil Rights History & Memorial Project needed a digital tool to gain key supporters. To facilitate this initial effort, we recommended a marketing microsite that would tell the project’s story to targeted prospects. The resulting design incorporates powerful visuals linking the cause to the historical event which it memorializes. The visuals are paired with compelling appeals and background information to establish the project and provide a foundation for giving. In launching a marketing site for our fundraising campaign, we needed a site that helped people identify with the cause; it needed to be done in just under two weeks and had to be done without breaking the bank. 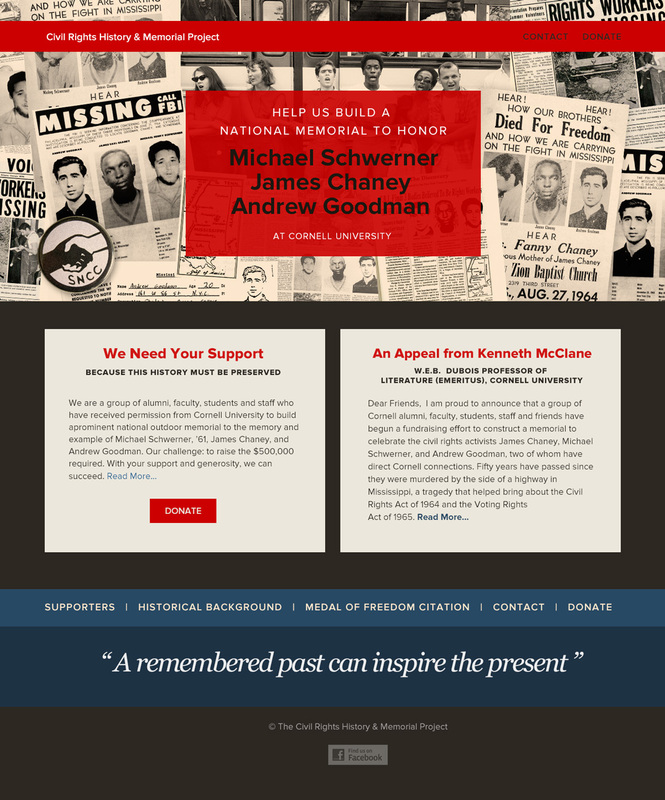 As an emerging nonprofit organization focused on funding a memorial of national prominence, it was important to produce the site for a reasonable cost and to build it to support larger and more comprehensive marketing efforts as the campaign proceeded. By selecting a few key high impact design customizations and using the Bootstrap framework, we were able to realize a unique design without needing to extensively modify the underlying framework. Working with this efficient process, we were also able to design and produce the fully responsive website in just two weeks.